In November last year, the Google Adwords team started testing a beta version of a new Google Adwords interface. The beta version was available to a few advertisers, but it has now been released to a wider audience including advertisers in the UK and Australia. If you are an Adwords advertiser, you probably have received an email from Google or noticed a link at the top right hand corner of your account offering you to switch to the new interface. According to Google, the new interface allows easier analysis, quicker editing and broader insights. At first sight, I was surprised to see a strong resemblance with the Yahoo Search Marketing Panama platform, but I quickly started to enjoy it. The new interface offers similar design features than Adwords Editor, which are quite pleasant. 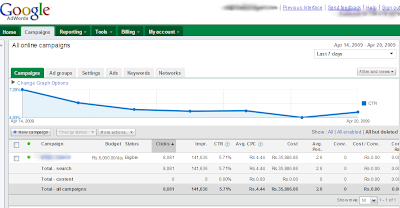 It allows to see all your ad groups data at once, which eliminates a lot of clicks and save quite a lot of time. Additional tabs and drop down menus have been added, which helps faster and more effective navigation. I also really liked the changes with negative keywords, which appear under a different section.